Did you know it costs a business about 5-10 times more to acquire a new customer than it does to sell to an existing one? Not only that, but on average, existing customers spend 67% more than new customers. It is therefore extremely important to keep your customers coming back, looking for more. In light of the statistics mentioned above, businesses must think about what they are doing to attract customers back to their business. 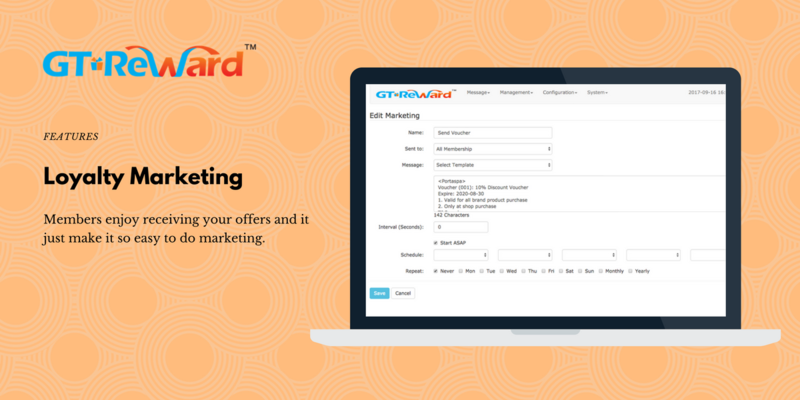 GT Reward Loyalty Management System is a perfect solution for business to setup their own loyalty reward system within days with fraction cost of the traditional loyalty program and get your customers to come more often. By using customer’s mobile phone number as the membership ID, business can save a ton by not printing the membership card. Business also can ask users to fill in the member registration form online through our user-friendly and interactive member’s portal, saving the cost of printing, handling the form, and movement from paper to computer. That make it so simple and cost-effective for businesses to adopt the GT Reward loyalty management system. The points system is the most common loyalty program. Frequent customers earn points, which translate into attractive rewards. Whether it’s a discount, a freebie, or special customer treatment, customers work towards a certain amount of points to redeem their reward. Where many companies falter in this method is making the relationship between points and tangible rewards complex and confusing for both themselves and customers. GT Reward system makes it so simple and transparent, member can understand the program easily and they will enjoy the loyalty program. 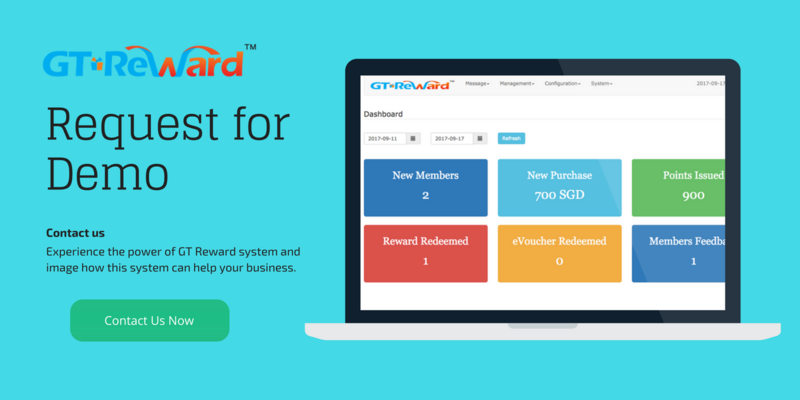 GT Reward system has many ways to reward customers through the loyalty point system. These loyalty points will entice customers to come back to the business more and more. – When customer sign up and become a member, they will get bonus points immediately. We would like to reward members spending more with the business, and the more they spend, the more points they get. For each dollar they spend, they will earn more points. 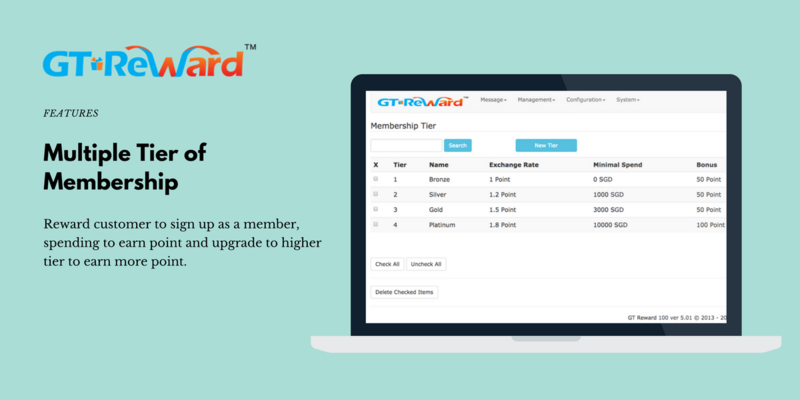 GT reward system can setup multiple tiers of membership, with each tier of membership having the minimal cumulative spending value. 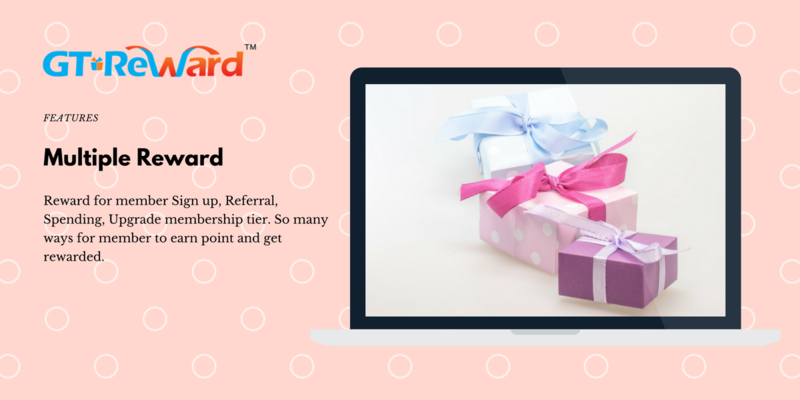 When member accumulate enough points to reach a new level, they earn more points for the same amount spent. That will motivate customers to spend more and upgrade their membership tier. For example, when a customer is a Bronze member, she will earn 1 point for each dollar spent. After she accumulates $1000 total spending with the business, her will be automatically upgraded to a Silver member, and she earns 1.2 point for each dollar spent. The higher the membership tier, the more points members can earn for each dollar spent. This encourages customers to spend more and keeps them coming back to the business. Getting customer feedback is really important for businesses, but traditional pen-and-paper methods are very costly and troublesome. With GT Reward customer feedback system, customers will automatically receive a SMS asking for feedback after every purchase. Customers only need to reply with a simple message with the rating. GT Reward system will capture that response and record it. Valuable information is captured, at no additional cost for the business. Vouchers are an effective way of marketing promotions. Through vouchers businesses can entice price-sensitive customers to spend more. But traditional printed vouchers are costly to design, print, distribute, redeem and keep track. 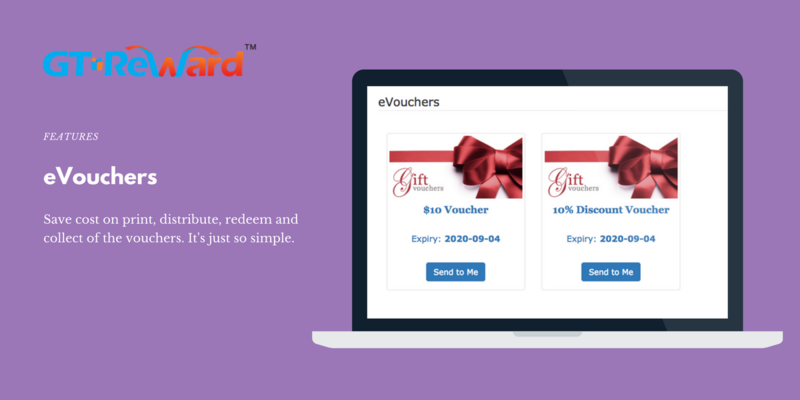 With GT Reward system, business can come up with a simple e-voucher quickly, and send to all members‘ mobile phone via SMS, utilising the effectiveness of vouchers with nearly no additional cost. With all the data on customer spendings, businesses can analyse these valuable information to improve their future marketing and operation in the long run. 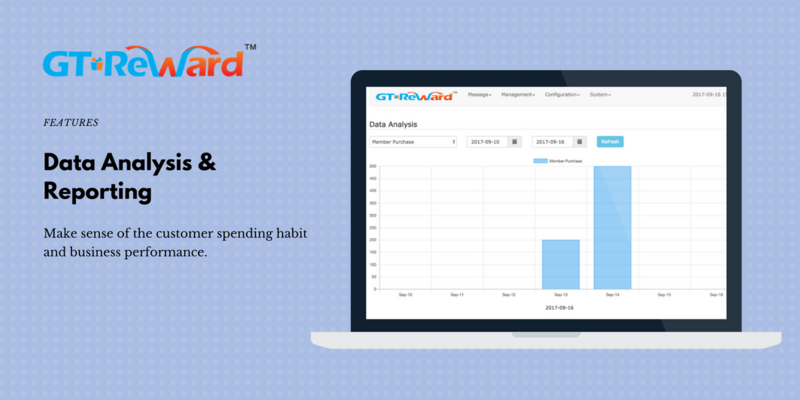 GT Reward system has many built-in charts and reports for business owners to get a clear picture of how their businesses have been faring so far and formulate the winning strategy of the next move. What makes GT Reward system unique is that it is build on top of GT Notify SMS marketing system. 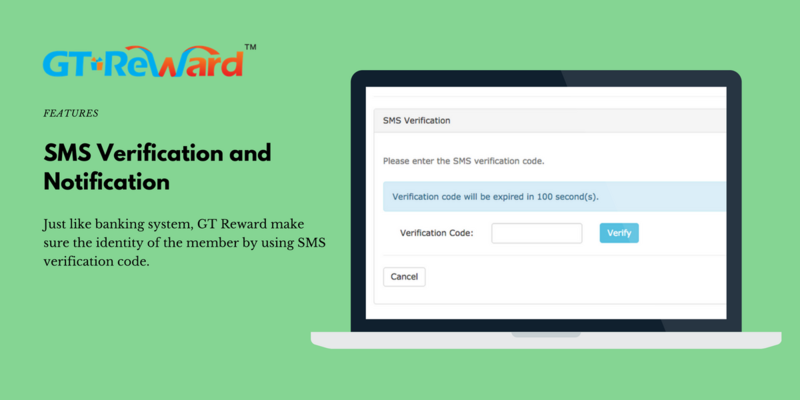 GT Reward system therefore can make use of the powerful SMS notification functions to really drive the business to go mobile and benefit from the member’s mobile phone. With SMS verification features, which is widely used by banking system, businesses can verify their member’s identity without using any cards. It is simple, fast and accurate. 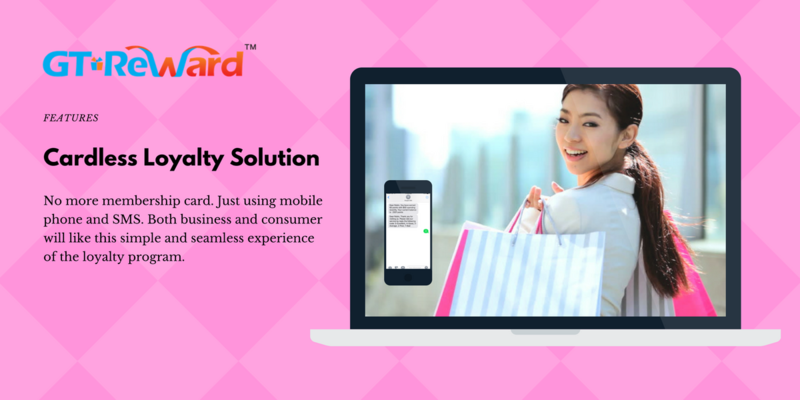 At the same time, it creates a direct connection between the businesses and their member’s mobile phone. 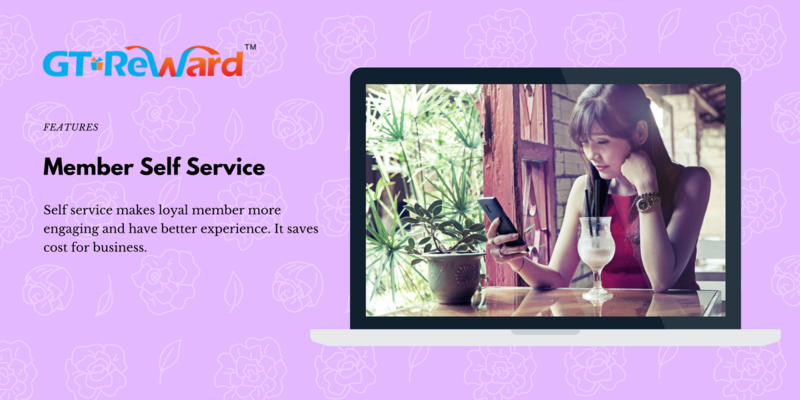 All the transaction details and updates will automatically be sent to member’s mobile phone, enhancing member experience like no others. In these days, self-service has become an increasingly popular option for customers. 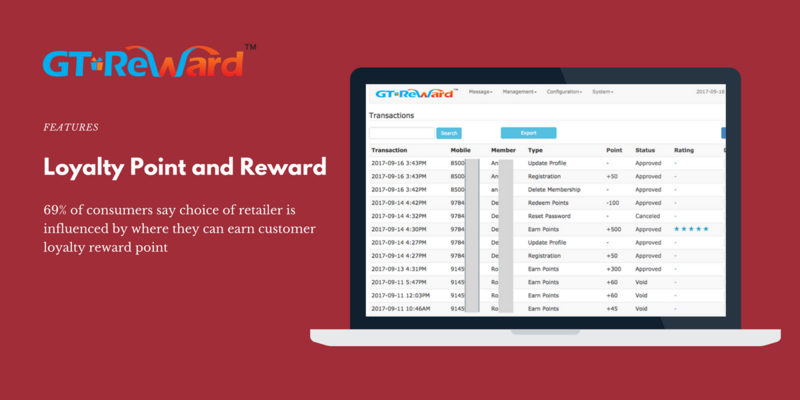 GT Reward system comes with the Member Self Submission feature, which allows customers to submit their own spending information through SMS to earn points. For businesses, entering data is an operation cost, but for customers, they will be motivated to send the data to business to earn points, a win-win situation. This saves business cost, and also enhances the member experience.